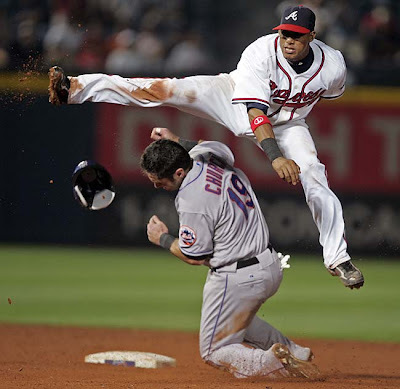 What are the Atlanta Brave going to do with Yunel Escobar, Kelly Johnson and now a returning Rafael Furcal? Could the Braves be re-entering the Jake Peavy sweepstakes? Shortstop Rafael Furcal is close to accepting a three-year, $30 million offer to return to the Atlanta Braves. The 31-year-old Furcal began his major league career with Atlanta, playing for the Braves from 2000 to 2005. He spent the last three seasons with the Los Angeles Dodgers. “He liked the idea of coming back to Atlanta, but there hasn’t been any formal agreement,” Furcal’s agent, Paul Kinzer, said. The deal would contain an option for 2012 that could become guaranteed. Furcal hit .357 last season with 5 home runs and 16 runs batted in but had back surgery July 3 and was limited to 36 games and 143 at-bats.